Even though the invasion and subsequent war in Afghanistan has been a total strategic disaster, now turning into a seemingly never-ending conflict, there hasn’t been a shortage of films, both fictional and documentary, about this foreign involvement. The situation was very different following the US invasion of Vietnam where Hollywood took years to be able to address the shameful defeat of the most powerful nation on Earth. (The trouble is that this preparedness to look at the open wounds doesn’t seem to have led to any significant reluctance to get involved in foreign wars, either on the side of the politicians or the public of the respective countries.) The most recent in this series of films is A War – Krigen, directed by Tobias Lindholm. One of the possible reasons for this spate of soul-searching is the advance in photographic technology. In the 1970s and 80s it wasn’t easy to make a film without a huge amount of resources. Today films can be, and have been, made on smart phones and light weight, yet high quality digital video cameras. It is from this standpoint that has made ‘A War’, a reasonably low-budget film produced from a relatively small country, possible. This is a film from the Danish perspective. Previous films have looked at the situation from the viewpoint of the two major players in the debacle, the Americans and the British, so it’s slightly refreshing to see how another, junior partner, in this coalition of hypocrisy and double-talk sees as its role on the world stage. Although the invasion of Afghanistan in 2001, under the name of ‘Operation Enduring Freedom’, was supposed to bring a better life to the inhabitants there’s no indication at all that there have been any real positive gains for the local populace. The Taliban haven’t been defeated, far from it. Recent information indicates they seem to be getting more powerful day by day as the ordinary Afghan peasant lives under the oppression and corruption of the ‘democratically elected’ government and its US/UK trained puppet army. So-called ‘collateral damage’ means that innocent people are daily at risk of being killed following their normal routine in order to survive. The cultivation of the heroine poppy has resumed with a vengeance resulting in the reappearance of drug lords, together with the inevitable violence and mayhem following such a trade (which had been virtually eliminated under the Taliban, as recognised by the United Nations only a matter of weeks before the invasion of the country in 2001) and tribal War Lords control huge swathes of the country. ‘A War – Krigen’ takes place in 2003 when it could be argued (at least by the occupying forces, not by me) that there was a chance of changing things for the better, that the armed forces from so many countries, a grand coalition – so as to spread the blame if not the glory – could still say, without a hint of irony, that they were there for the people of Afghanistan. But they were only there if it meant that casualties on the invading forces’ side were at an absolute minimum. These Danish soldiers whoop and holler at the death of a ‘terrorist’ but go into mental melt down when one of their own is injured – similar scenarios having also been depicted in previous fictional or documentary films about the war. Behind this is the mindset and thinking of the invading powers that because they have ‘right’ on their side they are, or, at least, should be, invincible. They have the technology, the weapons, the protection, the back up (both in terms of military intelligence and medical resources), that they are the ‘good guys’ – so how can they lose? This has been the thinking of the imperialist countries in all the wars, ‘insurgencies’, ’emergencies’ and uprisings they have been involved in since the end of the Second World War. They have the God-given right to do what they so chose in whatever part of the world they chose to do it and if anyone in those countries opposes their invasion they are immediately branded as being insurgents and terrorists (and other descriptions with negative and racist connotations) so therefore their lives are of no value and expendable. 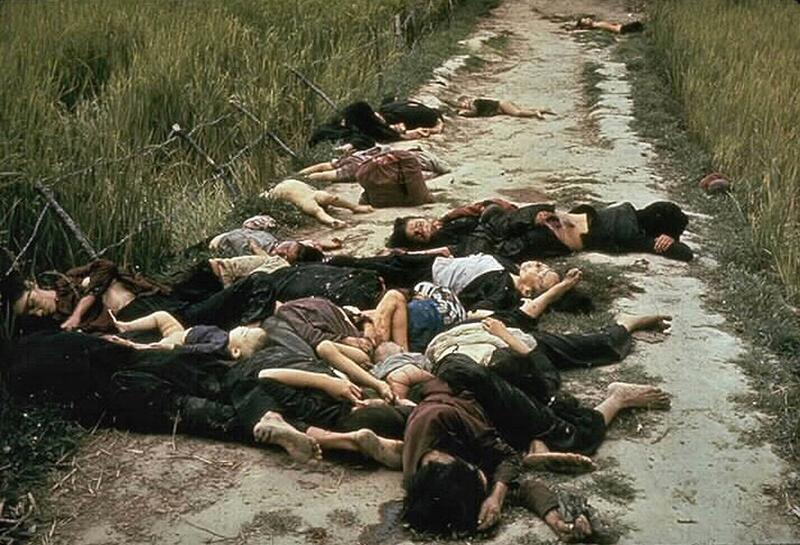 This way of looking at the local population resulted in the countless massacres committed by these forces of ‘democracy and freedom’ that was epitomised by the murderous attack on the Vietnamese villages around My Lai in March 1967. Although, I suppose, ever since warfare (even before anyone could enunciate the term, in whatever language) began the aim was to inflict the heaviest casualties on the enemy with the least to yourselves. However, in any conflict it would be ludicrous to expect that you can go up against an enemy and not sustain casualties. Granted the British have not been that good at the useless throwing away of young lives, witness the infamous ‘Charge of the Light Brigade’ in October 1854 during the Crimean War and the countless examples of huge casualties, with little or no territorial gain, on the Western Front in the War of 1914-19. But following on from the imperialist arrogance is an idea that war is in some manner ‘safe’. If we are fighting ‘evil’ when right is on our side, together with God, less body bags will be needed. Politicians who start these wars want to perpetuate such a fallacy as it allows them to convince the majority of unthinking people that the costs of war are not that great, that the days of high casualties are a thing of the past. This led to the crazy and bizarre situation that developed around the returning bodies from recent wars in the Middle East which arrived at the Royal Air Force base at Lyneham in Wiltshire in the South West of the UK. The parading of the coffins through the near-by town of Wootton Bassett, which at first was seen as a ‘proud’ nation honouring those who had died ‘to keep us safe’ became a political and military embarrassment. Making a big show on a few occasions was politically advantageous to the State but when it was a regular event it only went to show that the war wasn’t going the way the aggressors thought it would. One senior military officer even stated that such public displays of ‘grief’ were counter-productive as war will invariably mean death and it was dangerous to the State if death was fetishised. It is by putting this idea of the welfare of the injured to the fore that leads the Danish officer (who, in normal circumstances, shouldn’t have been on the front line at all anyway) to call in air support to attack and destroy a compound from where he ‘thinks’ the Taliban might be firing. The consequence of this is that a number of civilians, including children, end up being killed or wounded. For this he is recalled to Denmark to face a legal inquiry. This might be considered a genuine approach to dealing with the reasons for civilian casualties, especially when the issue is seen through the ‘liberal’ eyes of a Scandinavian country – although that liberalism is becoming somewhat tarnished with some of the more draconian laws that have been passed as a response to the increase in the number of migrants arriving in Europe in the last year or so. But by placing the incident in ‘the heat of war’ the commander has a get out, whether he is telling the truth or not. In the fifteen years of the foreign occupation the majority of the casualties have been civilians and most of them were killed by the occupying forces. The obscene term ‘collateral damage’ (coined by the Americans around 1968, in relation to possible outcomes of a nuclear conflict but then used in their war of aggression against the Vietnamese people) is now so commonly used that people in general don’t seem to baulk at the seriousness of the consequences of military action on the local populace. We can also see the hypocrisy of the US and other ‘western’ countries when a similar situation is indeed a crime when committed by others, e.g., the Russians in Syria in 2016, but is OK if committed by them in any theatre of war. We should also remember that the US refuses to allow any of their personnel to be committed for any sort of war crimes, even when one of their soldiers leaves a base, at night, twice, and goes on a killing spree, randomly murdering people in their beds. Cinema has rarely dealt with the issue of civilian deaths in the many wars since 1945, after which year civilians were no longer the ‘rear’ but the forefront of any conflict. This was even more so in those situations where the fighters were guerillas who lived amongst and came from the people. Taking Chairman Mao’s dictum that the guerillas should be ‘like fish swimming in water’ of the populace the reactionary forces sought to drain the rivers and lakes. Whereas ‘A War’ fudges this issue of civilian deaths (and gets publicity owing to it being nominated for an Academy Award) a film that addressed the use of drones in Afghanistan and Pakistan, ‘Good Kill’ (2014), was almost totally ignored. Being a ‘liberal’ country the case of the civilian deaths is investigated by the Danish military authorities and the commander called back home to face a court of inquiry. An interesting aspect of this inquiry was the depiction of the Danish court process itself, not just for this fictional case but for anyone who has to face ‘justice’ in that country. The informality makes the process much less intimidating than it is in a British or American setting and gives the impression, at least, that the person on trial is innocent until proven guilty. This was even down to using the given name rather than the surname of the accused. Although the viewer knows that the commander is guilty we have to wait to see if this guilt will be proven in an ‘impartial’ inquiry. Witness after witness gives evidence that seems to place another nail in the commander’s coffin until one witness states, categorically, that he ‘knew’ there was concrete evidence for the commander to call in the air strike, the consequences of which were the civilian deaths. This evidence gets the officer off. Now this particular development introduces interesting aspects of the military of capitalist and imperialist countries. If we can imagine that this situation is real and were to go into the future following this trial and ask ourselves who would be more trusted by his comrades, those who told the truth or the liar, we would have to say the liar. That’s because the very structure of capitalist armed forces is based upon a small group of people having absolute faith in the idea that those around each individual will be supported, in many ways unquestioningly, by the others in his group. In the situation presented to us in this film how could anyone have such trust in a person who was prepared to see the conviction of one of their own, albeit a senior officer? The countless cases of those soldiers accused of crimes in the invasions of Middle Eastern countries in the 21st century, with none of them ending up being ‘proven’, is testimony to the closed nature of such groups of killers. It’s exactly the same situation amongst the police where there’s an unwritten code of practice in which the truth is just far too inconvenient. There is another consequence of these constant invasions and wars and this is the effect that the killing process has on those very well supported, very well supplied and very well armed soldiers. This is demonstrated in a scene early in the film. A situation arises where one of the members of the patrol is so traumatised by one of his comrades stepping on an IED (Improvised Explosive Device) that he virtually breaks down and refuses to go on patrol. Being a ‘liberal’ country the Danish commander (who establishes his credentials as caring and concerned about those under his command) allows him to be reassigned to base duties until he can get his act together. Here we are presented with the issue of PTSD (Post Traumatic Stress Disorder). Now in 2003 it could have been possible to say that those who were in the armies of the imperialist invaders weren’t aware of the consequences of what they were doing. I say ‘could’ rather than ‘would’ as I would have thought that anyone who is prepared to be taught how to use instruments whose only purpose is to kill should understand that death was going to be the consequence of those instruments being used. The hope is that the deaths would be ‘theirs’ but, from time to time, it could be ‘ours’. So why the surprise? Despite how they might be presented at times in the past armies are killing machines, they are not an arm of the social services. It’s also important to remember that all the armies from all the countries that have been part of a US led ‘coalition’ are composed of volunteers. They are not conscripts as they were in the wars in Korea or Vietnam. These men and women had, and still do, make a conscious decision to enlist. I don’t know why they are surprised when they are confronted with the realities of war. Are they so stupid that they think the real thing is like the computer games that might have convinced them to join up in the first place? That once someone is killed all they have to do is reboot and they will come alive again? If that’s valid for 2003 how much more valid is it for 2016? Those who are joining these armies now were only toddlers when these 21st century wars of aggression started and since the ‘war of terrorism without end’ began. If they watch the news and think they want to be like John Wayne (who never fired a bullet against a real enemy and, therefore, never had to face danger himself, unlike many in Hollywood, either the actors or scriptwriters he was party to ostracising at the time of (HUAC) the House Un-American Activities Committee – see the film ‘Trumbo’ for a good take on Wayne’s ‘patriotism’) don’t they also know that PTSD is a part of these wars? So now that issue is becoming a drain of health services, a problem to the societies to which they return yet still not an issue that makes people address the validity of such wars in the first place. And, most importantly of all in this, the mental welfare of the men, women and children who are on the receiving end of all these billions of pounds worth of munitions is not considered at all. The wars nominally being fought for their well-being and future don’t take their well-being and future into account. Finally, other films addressing the war in Afghanistan have almost exclusively concentrated on the soldiers in the country itself, their home lives only considered as an aside, being part of banter amongst the soldiers, referenced by telephone/Skype conversations with family members or by images of the ‘life they left behind’ on the walls of their barracks. In ‘A War’ not only do we get the court room scenes back in Denmark we also get an indication of the problems that can occur within the family as a consequence of the father being away for such a long time. But here we have another contradiction. We are talking about 2003, a couple of years after the ‘war on terror’ began. Presumably the wife of the commander married, and had children, with a man who was in the military but then he was only playing at being a soldier, not killing other people and not being put in danger. Things start to fall apart when he is doing the job he signed up for many years before and for which he is being paid. So why this shock when matters develop so that he actually does what he was trained to do? Why are so many parents and families proud of their sons and daughters dressed in their smart uniforms at their coming out parades not aware what they could face in the future? Why is it always someone else’s fault if they should get killed or injured in a foreign country? Why do so many people want to claim victim status? If you make a conscious decision to go to another country and kill its people live (or die) with the consequences. If Denmark is not exactly an imperialist nation at present it is certainly there to support the interests of the most aggressive and powerful imperialist nation at the moment, that is the USA. NATO (the North Atlantic Treaty Alliance) exists to dance to the tune that the US decides to play. Huge resources, from all the countries in the organisation, are directed towards this end. As the grip of capitalism and imperialism weakens the necessity for these national forces to get involved in international conflicts has increased – and this will be even more so in the foreseeable future. Imperialism appears to be strong because it seems to have the ability to respond in any part of the world with massive amounts of force. But can this really be seen as a success for imperialism? In Afghanistan the US has been involved in the longest war in the country’s history – and it’s not fully disengaged yet. In 2001 GW Bush declared the ‘war on terror’ would go on as long as it takes and in the middle of February 2016 the French Prime Minister said that ‘hyper-terrorism (whatever that might be) is here to stay’. So the imperialist powers have already admitted that all the invasions of the 21st century have not achieved, in any sense whatsoever, the goals they set themselves 15 years ago. So, as far as imperialism is concerned, we are in a more dangerous situation than the world was at even the height of the ‘Cold War’. The threat of nuclear extinction from the Soviet Union has been replaced by an enemy that hates what the west represents in a way never seen before. In the past those people who had suffered at the hands of rapacious and murderous imperialism, from the Americas through to Africa and on to Asia have, in some ways, ‘forgiven’ the oppressors or, at least, pushed the events of the past to the back of their minds. Not now. Those groups whose foundation goes back to the times of anti-Communism in Afghanistan are not thanking their progenitor. Just the opposite. The child hates the father in a way not before seen in modern times. The chickens have truly come home to roost. The so-called ‘Arab Spring’ of 2010/11 has changed the situation in the countries were it took place not one iota. Whatever the optimism and enthusiasm that existed over that period of time some of the faces at the top might have changed but substantially the situation for the vast majority of the population remains the same. Worse than that, some of those countries which underwent a popular uprising are even more aggressive, both nationally and internationally, as they were prior to 2010, Turkey being a case in point. It’s true that imperialism has succeeded in destroying those functioning societies that were a potential threat to its interests in the region, in the case of Iraq, Libya and Syria, but at what cost to the people? Those once strong militarily countries whose leaders were from time to time courted by the ‘west’ when it suited, are now in chaos with the consequences beginning to have an effect on Europe as more and more refugees seek sanctuary in a part of the world that caused the problem in the first place. But the populations of the countries who have gave birth to, then incubated this hatred so that it has grown into a myriad of western value hating groups in an increasing number of countries throughout the world, don’t seem to realise that they are part of the problem themselves. Their acquiescence in the face of the jingoism and sabre rattling of their ‘democratically’ elected governments is forgotten. The ones who are fundamentally the cause of the problem claim victim status. Those killed in acts by these ‘fundamentalist’ groups are described as ‘innocents’ yet those civilians killed in drone attacks, air raids or just because they were in the wrong place at the time of a military operation are dismissed as being merely ‘collateral damage’ and all the resources of the invading forces is put into sanitising and excusing those responsible. The lives of an Afghani or an Iraqi is considered of lower value to that of a European. Is it any wonder that people are angry? ‘A War’ is not, by any means, the best film about the invasion of Afghanistan or any other wars that are taking place at the moment (or even of those to come) but it does offer the opportunity for people to look at their own complicity and hypocrisy if they care to do so. I fear, as has been the case in all the other imperialist attempts to maintain or increase their influence in the past, most people will just hope that the problem will go away. It might have quietened down in the past but the result is unlikely to be the same in the present or the future. One day people are going to have to make a decision to challenge the status quo otherwise this war really will go on forever. There are more than six hundred lapidars so far listed by the Albanian Lapidar Survey but they are not the only examples of Socialist Realist Art that tell the story of the country, especially after Independence in 1944. Although a considerable number of lapidars are in a sorry state, whether due to neglect or outright political vandalism, there seems to be a move, at present, to ‘preserve’ those which are still in existence. However, I’m not aware of a similar programme (whether nationally or locally organised) that pays attention to the many statues, mosaics and panels that celebrate the achievements of the people. The panel to the miners in the small village of Krrabë is one such example. The area around Krrabë, during the Socialist period, was a centre of coal mining. When that changed I don’t know but on my visit there was absolutely no indication that mining had ever taken place nearby – except for the panel to the right of the entrance door to what looks like a community centre. The panel is made from plaster and is about three by two metres in size, the figures depicted being roughly life-size. It’s not fixed to the wall as such but rests on two large iron supports. The image is of a small group of miners coming out of the mine at the end of the shift. We can make out the curved entrance to the tunnel at the very top of the panel and the group of seven miners is closely bunched up. They are looking in different directions as if they were talking to their comrades as they leave work. At their feet there’s an intersection of three railway lines, used to take the coal from the mine. On each head can be seen a hard hat with a circular miners lamp attached at the front. The features of the first three are the most distinct. The one on the left is facing forward and his left hand is bent over his chest, holding the end of what looks like an iron bar. His right arm is hanging down at his side. He’s wearing a jacket and trousers and has heavy boots on his feet. I assume that his dress indicates that he isn’t a coal face worker but has other tasks down the mine. The miner on the right is dressed in a one piece overall and in his left hand he holds the handle of a round point shovel, close to the metal blade, which is at the height of his left knee. The handle angles up to the right of the panel, finishing just short of the edge. There’s a strap coming down from his left shoulder to his right hip, probably for some sort of satchel. He is looking over to his comrade on his right as if talking to him (so we only see his face in profile) and his right arm is outstretched as if he is making a point, or slapping him on the back. The body of the miner in the middle is slightly obscured by the first two. He is also looking forward but doesn’t seem to be part of the discussion, perhaps a bit further back. He also seems to be wearing overalls. The others in the tableau we only see partially. To the left of the head of the first miner described is the head only, in profile of another male. To the right of his head, and slightly above, is the partial face of another miner. Only the nose and right eye is visible, underneath the hard hat. This one is different from all the rest as the face has the characteristics of a female, being more rounded than all the men’s images. My ignorance comes to the fore here as I’m not sure if women did work underground in the mines. There’s no real reason why they shouldn’t have done so as they were in all other occupations in the country but I haven’t seen anything, so far, to confirm this. 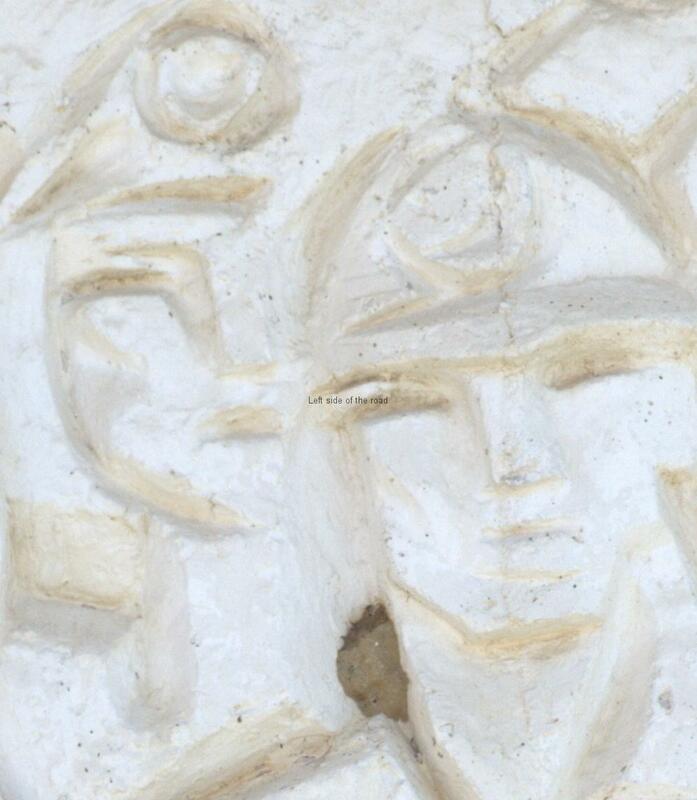 To the right of the individual in the centre of the panel we can make out a face and helmet but there’s more of an impression than a sculptured face. All the faces are very angular, this one being especially so. Finally we see nothing of the person but just under the roof of the tunnel is a partial depiction of a hard hat with the round miners lamp at the front. The panel seems to be in a reasonable condition. The only damage I could make out was the broken nose of the miner who’s carrying the iron rod. There doesn’t seem to be any weather damage, it receives some protection from the eaves of the roof, and looks as if it had been relatively recently re/painted – most original monuments being the bare plaster or concrete. In one sense these examples of art from the period of 1944 to 1991 are more at risk than some of the lapidars. This is mainly because they are attached to buildings and some of those can be in very attractive locations and risk being demolished and the decoration being lost forever – land and property speculation is as rife in Albania as in any other country. 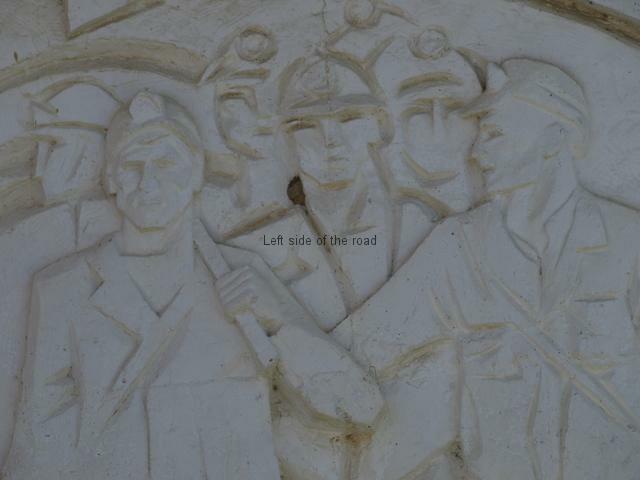 This was the fate of the bas-relief to the Tobacco Workers Strike in Durres. On the other hand such a monument with a very local connection might well be protected by those who live there. Time will tell. As you come up hill into the village, passing the lower buildings, there’s an interesting reminder of the past on the wall of a one story building on the right. In a ridged roundel is a red star on a green background. This is a fairly major piece of art work and I would assume that this location would have been the building of the local Party of Labour Branch. The star in itself is interesting but this particular one is accompanied by other tantalising snippets of information. Similar stars would have been common during the Socialist period but I haven’t seen many. The roundel is well made and inside, through the use of different coloured stones, there’s a simple mosaic of the star. Five pieces of isosceles triangular red stones, their apex touching the inside edge of the roundel, each meet, at the base, a narrow, rectangular piece of red stone which creates a regular pentagon. These border pieces are offset from the plane of the star points and creates a clearly defined ridge. Inside the border a stone, in the shape of a pentagon, finishes the star. As I’ve stated in all the posts about the lapidars the red star is the symbol of Communism and the Communist Party. I would interpret the green as representing the countryside. However, this red star has something quite unique in the centre. If you look carefully you’ll see that a small Hammer and Sickle has been carved into the stone. This is the symbol adopted by what became the Communist Party of the Soviet Union during the Russian Revolution of 1917, symbolising the unity of the industrial workers with the peasants of the countryside. It was also later adopted as one of the symbols – in gold – of the national flag (together with a golden star on a red background). The pairing was also adopted by other Communist movements in subsequent years but very soon after Liberation the Party of Labour adopted their own, national, symbol to represent their struggle and that was of the Pickaxe and Rifle, symbolising the need to build and protect Socialism with the preparedness to fight for, and to defend, it. Around the central motif are other interesting carvings. 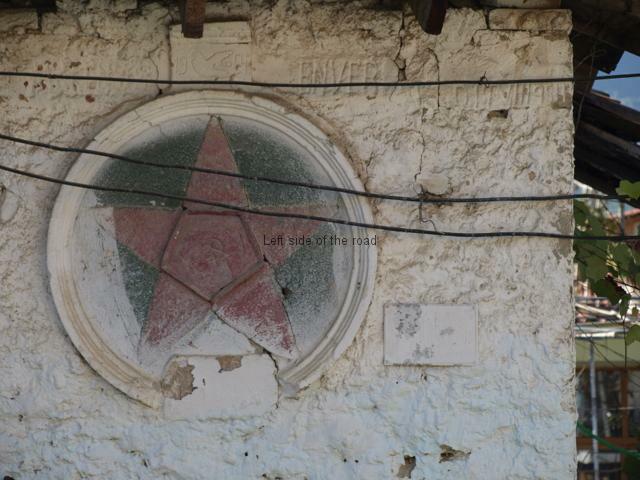 Immediately above the topmost point of the red star is a rough image of a dove (symbolising Peace) carved into a piece of white, smooth plaster. On the left of the dove is the number 19, on the right the number 54, so something happened here in 1954. To the right of the dove, now being carved into the plaster rendering of the wall, is the name Enver. This would be Enver Hoxha, the leader of the Party of Labour of Albania. Further still to the right, and finishing at the corner of the building, are other carvings. I think I can make out the Roman numerals VII and the numbers 1954, so my assumption is that this indicates July 1954. Perhaps the indistinct letters/numerals tell which day in July. This could well be a local way of celebrating a visit to the community by Enver Hoxha in that year. I’ll try to get a closer view of these images during my next visit. The star hasn’t been treated with loving care over the years but then neither has it been seriously vandalised. When the wall has been white-washed not a great deal of care has been taken to avoid paint splashing over the roundel. However, this doesn’t mean that a re-writing of history has not been attempted. At the very bottom of star a section of the roundel has been cut away and a rectangular, inscribed stone inserted. For whatever reason this has been plastered over but time and the weather have broken away some of this new covering and letters can be see underneath. What they are will have to await another visit to Krrabë.